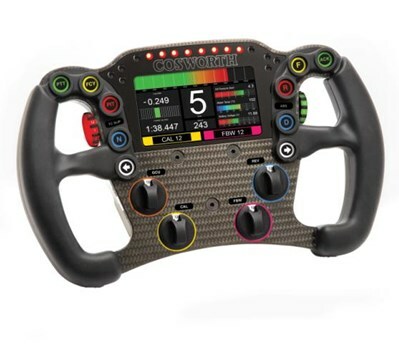 The Cosworth CCW Mk2 is a lightweight, FIA certified, carbon steering wheel designed and built to the highest standards. The CCWMk2 has a diameter of 280mm and integrates a rich 4.3″ 900 nit sunlight viewable TFT display boasting high graphical resolution at 480×272 QVGA with 16.7M colours. The display is paired with ten shift and six alarm LEDs, all tri-colour and fully configurable from the latest Cosworth Toolset PC software package. Available in two variants; Souriau (8STA) or Deutsch Autosport (AS) designed to support either Cosworth or SPA quick release mechanisms respectively.